We thought it was pretty obvious, but apparently there are those who still haven’t figured it out. 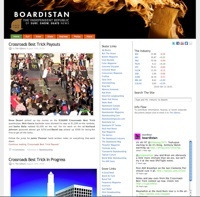 If Sacklunch.com was something you enjoyed reading in the past and you’d like to see what the editors are doing now, just click this link to visit Boardistan.com. Same stuff, different URL. The content breakdown goes something like this: content from July 1999 until December 2006 can be found here in the Sacklunch 1.0 Archives. From November 2006 until February 2007 it is on the Sacklunch site here, and for the rest (July 2008 forward) please visit Boardistan.com. Someday we’re going to put it all together in one place, under one name. Maybe.